streepainting, originally uploaded by jahansell. 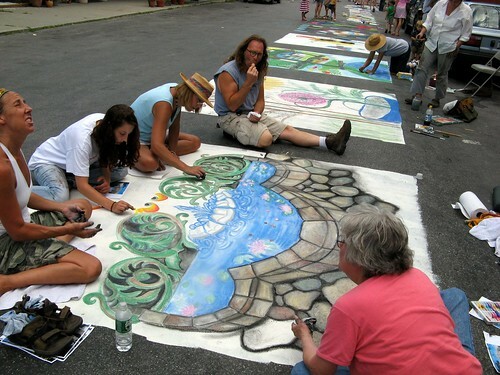 One last picture of the Family Arts Festival - we closed the street and painted blocks along it for folks to paint - it's all washed away now but for a few hours on Saturday it was an art gallery to rival any in town! This looks to be a LOT of fun! In Stat e College we had the same thing at the Arts Festival. I like your blog, it looks very 'cosy', which means 'nice'or 'gezellig'in Dutch. Remember that you visited my (Dutch-English) blog? You named a Dutch group "NDTII"? I tried to find them but don't know who they are... that SO irritating, can you find out their full name please? Aren't these wonderful; such a shame they get washed away. I have seldom seen street artists in Sudbury but those I have are so talented. . . are we ever going to have photo of Sharon, on the Sharon CT Daily Photo page again? Geez, anonymous, if you're going to leave a criticism, at least tell me who you are! (Or I guess that's the point.) Anyway, so sorry - I've been spending just about every waking hour in Millerton these days! I'll get back to Sharon though, I promise! Thats me in the picture! (making a face of corse...) we had a great day of painting in the HOT sun.... 3 generations from Sharon CT! My Mom Lynn C., Me Jenn H., My sister Tara P. and my daughter Sarah H. we hope to get more artists to join next year! Thanks for posting our picture of the "wishing well" and promoting the beauty of Sharon CT!